Can Dementia and Cognitive Decline Be Reversed? Dietary supplements such as vitamin E, Omega-3s, curcumin, ginko biloba, coconut oil, and other vitamins and minerals basically have no dietary benefits on dementia or other cognitive problems or there is not enough data to prove it, as reported by the Center for Complementary and Integrative Health: NIH. Wait a minute! The real problem could be this: A significant part of our population either has celiac disease or gluten intolerance and is malabsorbing to many different degrees, so it stands to reason that these supplements or even a multi-vitamin may not be well absorbed. In addition, the vitamins and minerals needed to keep your brain and neurons functioning optimally may not be absorbed from the good food we eat eventually leading to brain fog, cognitive issues, and a raft of ailments. This appears to be a no-brainer to me! Knowing that about 80% of those with celiac (1/100) are still undiagnosed don’t you wonder what could be happening to those poor folks. I would suggest they are on their way (many already there) to the utmost of ill health: cognitive issues, organ failure, compromised pregnancies, cancers, osteoporosis, autoimmune diseases…what more is there? New research exists on dementia turning around. I need to find it. Meanwhile if you have most any chronic issue, don’t take it lightly and know that many of you can do something about so much of your chronic health issues. You are in the driver’s seat. I have to admit I did something quite stupid recently, and I paid for it. Mind you, I would never knowingly touch a crumb of gluten. Yes, it’s that nasty for probably about 30% of the population according to some experts. Whether you have celiac disease or are gluten intolerant you should never consume this troublesome protein. We were out for a bite of dinner and I ordered a gluten-free vegetarian pizza. When it arrived I realized I’d forgotten to ask for no dairy. The waitress was happy to get me another pizza without cheese, but I said, against my better judgement, not to bother. I managed to foolishly consume most of it. At the gym the next morning I would say I was about 20% off my usual self. I could feel my lower back around my spine, my leg muscles talked to me, my energy wasn’t quite there, and my balance and rhythm were a bit off. I was also a bit stuffy. You might think this isn’t so bad, but with repeated indulgence of foods our body recognizes as “the bad guy” along with the # 1 “bad boy, gluten” that many of you are in sheer denial about, the inflammation that is generated may be wearing away at numerous levels of your health. Gluten can affect any part of your body in a degenerative manner, and dairy seems to be affecting about 50% of those on a GF diet that I talk to. Do you have aches and pains, fatigue, general ill health, brain fog, skin or gastro issues? Download the Free Report on the Home page upper right corner for a list of 50 symptoms and disorders linked to gluten at http://toxicstaple.com. Gluten and dairy may be at the root of what’s ailing you or someone you love. Dig your head out of the sand before your health spirals down any further. There is no end to the research on a lengthy list of over 300 symptoms and diseases linked to gluten. It appears through copious reading since 2004 that there’s not much illness that’s not linked to gluten and often dairy, as many of my storytellers report. Add in heavy metals, dirty water and air, chemicals and plastics, and you have a toxic soup of degenerative disease and numerous ailments. At least clean up the toxins in your environment you can control before they control you! Become your own advocate to rise above your ailments and live a longer, stronger, healthier life. Do it now before your health issues become much worse. You can do this! Watt, J., J. R. Pincott, and J. T. Harries. “Combined Cow’s Milk Protein and Gluten-induced Enteropathy: Common or Rare?” Gut 24 (1983): 165–70. Chronic Fatigue Syndrome or Myalgic Encephalomyelitis: Is It Linked To Gluten? Just as I was getting out of the car I heard on NPR that in England 1 out of fifty teens (16 years old) were affected by chronic fatigue syndrome (CFS), also known as myalgic encephalomyelitis (ME). The lives of these kids were being greatly affected by fatigue and other disabling symptoms. I wondered how many younger children were affected as I recalled that my grandson was so tired after dinner he needed help getting into his PJs and up the stairs. This was definitely not normal for a five-year-old. His doctor had no idea what was going on. There was no mention of gluten or celiac disease as contributing to the CFS in the report. Typical of so much research on numerous illnesses that is more interested in peddling drugs than in what is the root cause of the illness. It is high time doctors were educated on the hazards of gluten, but since there is huge unawareness of what gluten can do to the human body and brain you must become your own advocate in a quest for better health. 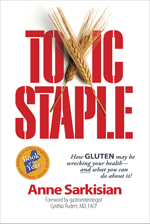 Those of you who know anyone with most any chronic symptom please share my website http://www.toxicstaple.com on my award-winning, life-transforming book, Toxic Staple: How Gluten May Be Wrecking Your Health and What You Can Do About It! This is a must read if illness is troubling your family, most any kind of illness: autoimmune, cancer, neurological, organ and skin ailments, women’s and pregnancy issues, and more. It is huge information! If you or your child suffers from fatigue/exhaustion, headaches, brain-fog/memory issues, muscle and joint pain, and so much more PLEASE get educated on the hazards of gluten. Read Toxic Staple. Discover the tests you need to REQUEST (or you may not get enough) to get to the bottom of gluten intolerance. Treasure your life enough to get it and keep it healthy!